This month, Dubspot’s Dan Freeman (C0m1x) heads back to Brazil to host the Dubspot International EDU Sessions in Rio de Janeiro. For more information on Dubspot’s Ableton programs, head to our Ableton Live course pages and learn more. 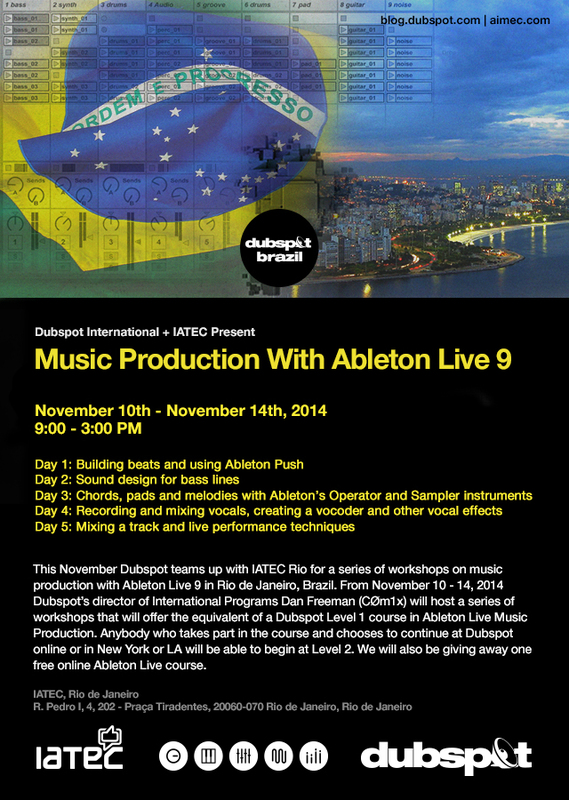 This November Dubspot teams up with IATEC Rio for a series of workshops on music production with Ableton Live 9 in Rio de Janeiro, Brazil. From November 10 – 14, 2014 Dubspot’s director of International Programs Dan Freeman (CØm1x) will host a series of workshops that will offer the equivalent of a Dubspot Level 1 course in Ableton Live Music Production. Anybody who takes part in the course and chooses to continue at Dubspot online or in New York or LA will be able to begin at Level 2. We will also be giving away one free online Ableton Live course. Dan Freeman (CØm1x) is a Brooklyn­based bassist/producer. Originally from Boston, Dan trained as a classical pianist at the New England Conservatory Preparatory School before switching to jazz bass. He graduated from Harvard College and then came to New York to study at the Bass Collective where he studied with John Pattitucci, Matthew Garrison and Richard Bona. As a bassist he has also performed with, among others Angelique Kidjo, the B­52’s and performed in Europe, North and South America in venues from underground Brooklyn loft parties to Carnegie Hall. He was also the keyboardist for RCA Records’ Stellastarr* and the musical director/bassist for Virgin Records’ artist Xavier. Dan currently is the leader of Comandante Zero (CØ), a digital electro­funk music/art collective from Brooklyn, NY. Formed in 2008, they have created a cutting edge multimedia show that melds the latest digital music and art technology with live instruments. They have performed extensively in New York City, LA, London, Berlin and Latin America, including such prestigious festivals/venues such as the Brooklyn Museum (NY), The Brooklyn Academy Of Music (NY), CMJ (New York) Berghain (Berlin) and the House Of Blues (LA). They have also given lectures/demonstrations on integrating live and digital instruments at universities and festivals such as Harvard University (US), the Universidad de Caldas (Colombia) and the Universidad de Santiago (Chile). Their last record (Slouching Towards Babylon, Part 1) was produced and mixed by Grammy­award winning producer/engineer Bob Power. Dan also mixes and produces under the production name CØm1x. He has a production studio in Gowanus, Brooklyn where he works with artists, remixes and composes for film. Currently he is also creating a live solo Acid House/Funk set using the Ableton PUSH instrument and has made several videos on techniques for using the PUSH in live performance. 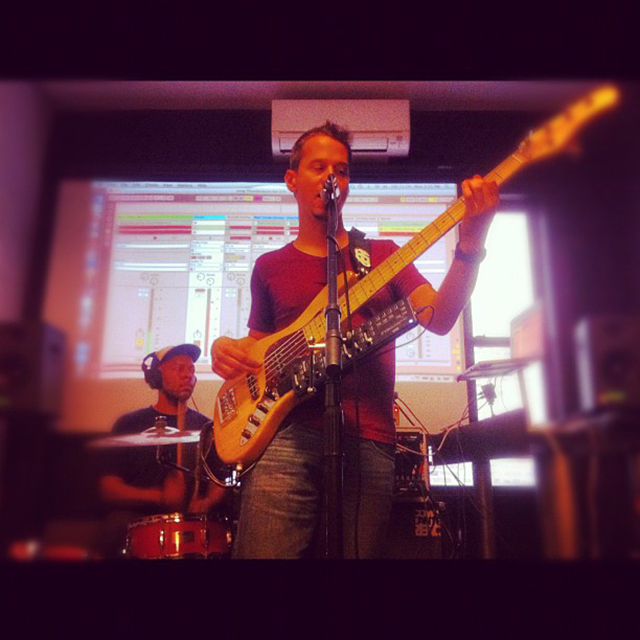 Dan is a faculty member at Dubspot in New York City, where he teaches electronic music production and music history. He is also an Ableton Certified Trainer and his specialty is using Ableton Live for live performance, especially with instruments and vocals. In his position as the head of Dubspot International, he has organized, presented and performed at events, festivals and universities worldwide. He also hosts the Dubspot/New York City Ableton User Group.